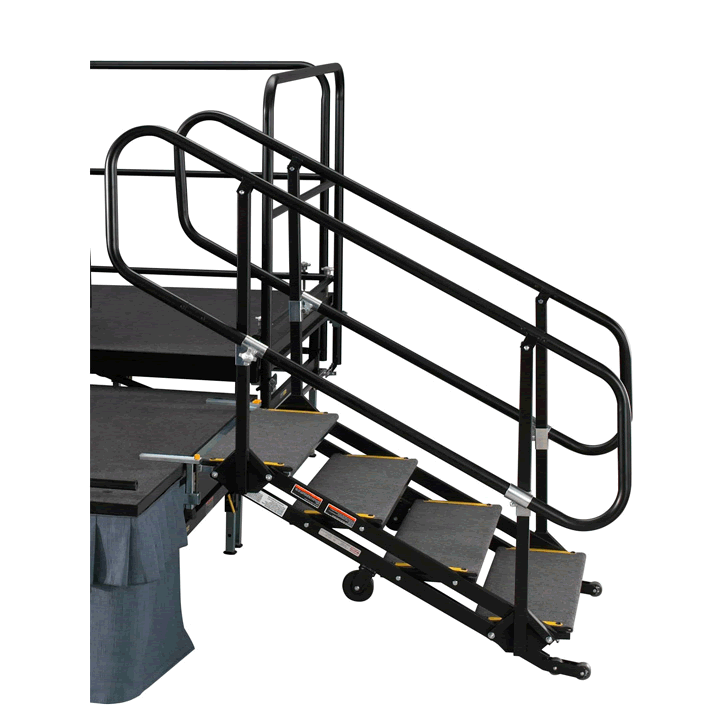 Articulating or modular stage steps are available in multiple step configurations. 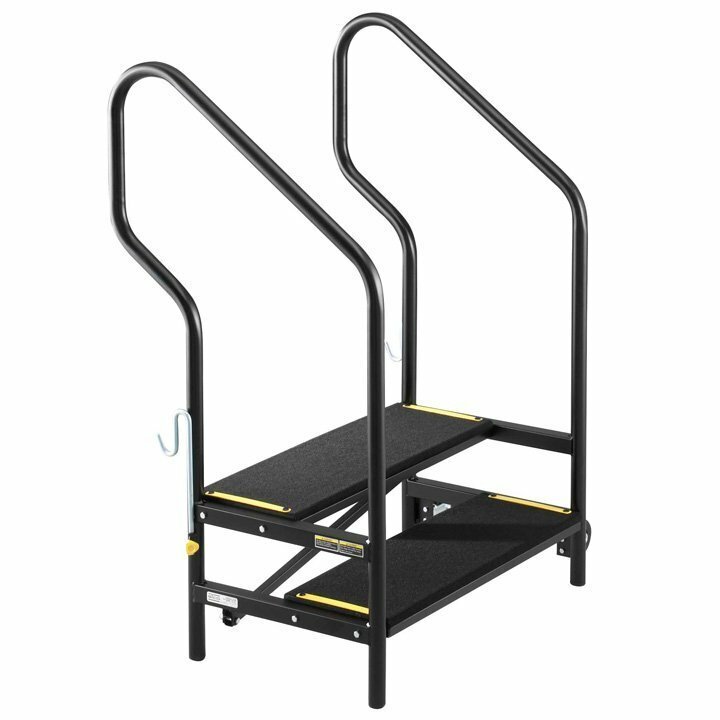 Each step platform rolls and locks into place with ease. Steps are available with carpet or black vinyl on the tread. • 1″ x 16 gauge or heavier tubular steel. • Electric arc-welded construction with a black powder coat finish. • Option of carpet or black vinyl. • 12″ wide by 36″ long in 5/8″ thick exterior grade plywood. • Attached to frame with 5/16″ bolts through the frame and boards secured by nuts. • Attach to the stage using a quick attachment feature without the use of separate hardware. 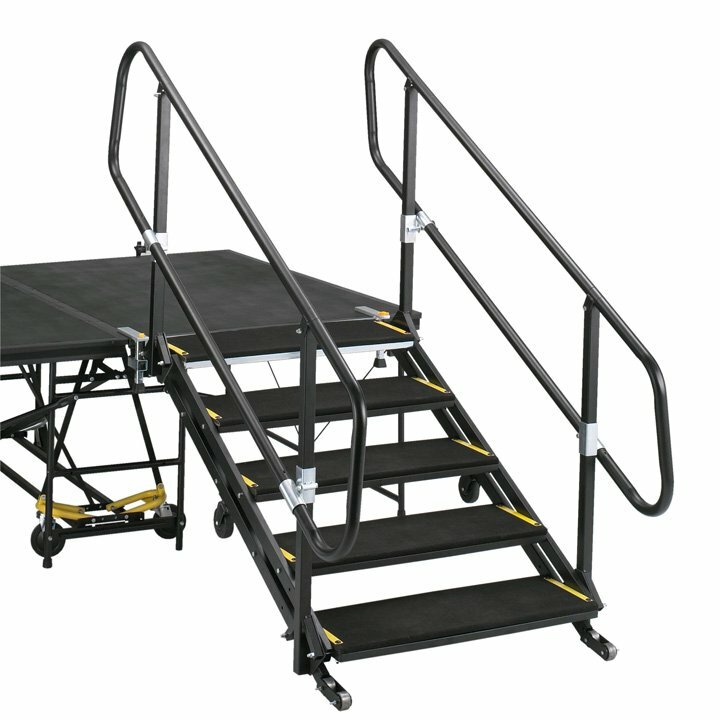 Steps with wheels and guardrails have permanent guardrails attached & running the full length of steps. 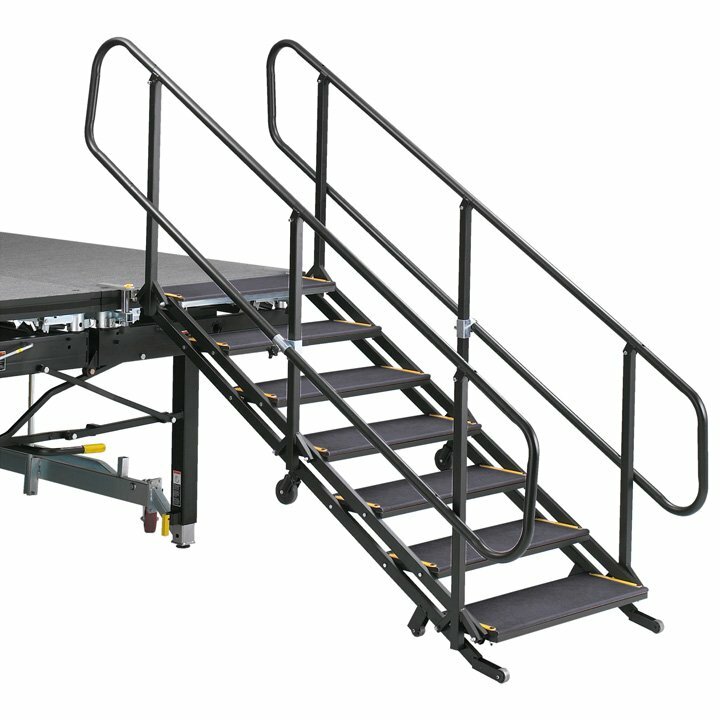 Steps have casters attached to allow the step unit to be rolled to location. Step assemblies have a minimum of four load bearing floor contacts. Two yellow safety strips are bolted to the edges of each stair tread. Steps allow for easy access behind step unit, to hang the drapes. • 1 Step rise for stages 6” or 12” high. No wheels or guardrails. • 1 Step rise for stages 8” or 16” high. No wheel or guardrails. • 2 Step rise for stages 12” or 18” high. No wheels or guardrails. • 2 Step rise for stages 16” or 24” high. No wheels or guardrails. • 2 Step rise for stages 12” or 18” high with wheels and guardrails. 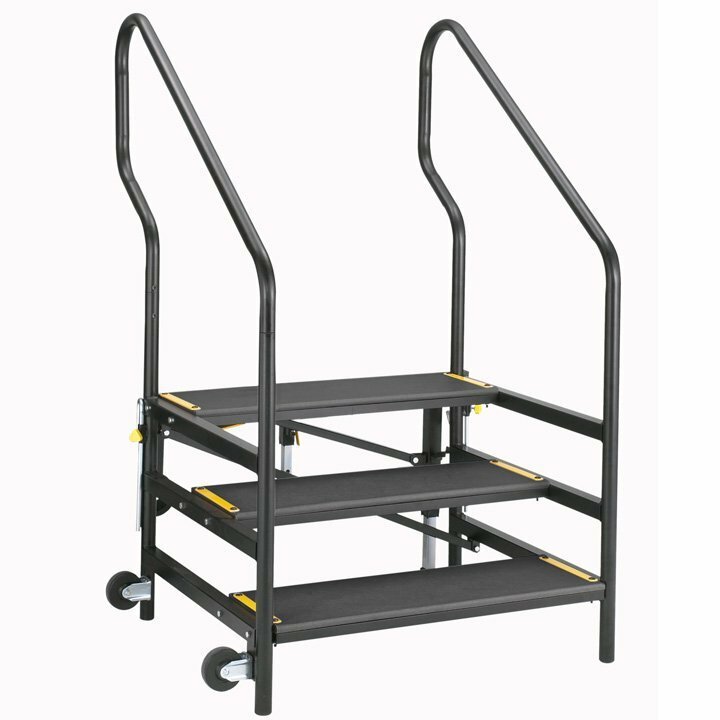 • 2 Step rise for stages 16” or 24” high with wheels and guardrails. 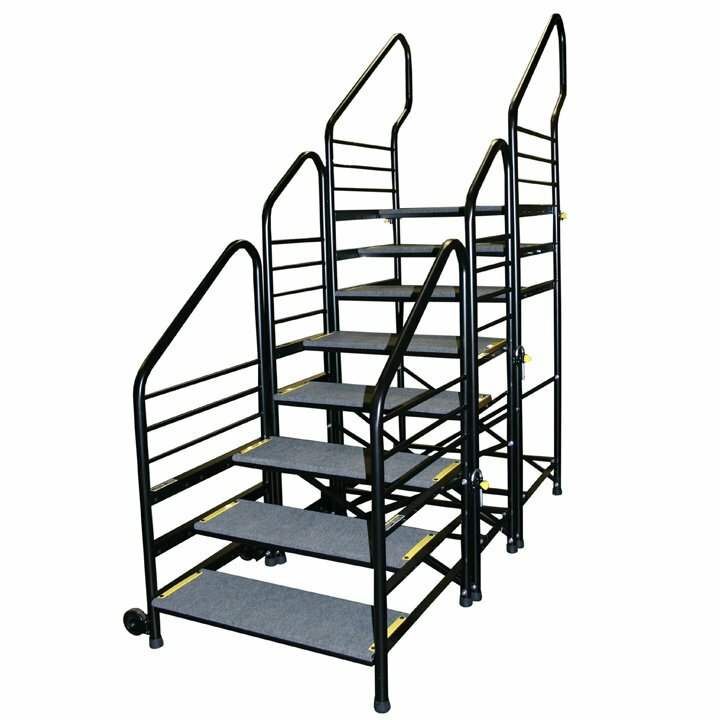 • 3 Step rise for stages 18” or 24” high with wheels and guardrails. • 3 Step rise for stages 24” or 32” high with wheels and guardrails. • 4 Step rise for stages 16” to 32” high with wheels and guardrails. • 5 Step rise for stages 20” to 40” high with wheels and guardrails. • 6 Step rise for stages 24” to 48” high with wheels and guardrails. • 7 Step rise for stages 28” to 56” high with wheels and guardrails. • 8 Step rise for stages 40” to 64” high with wheels and guardrails. • 9 Step rise for stages 48” to 72” high with wheels and guardrails. 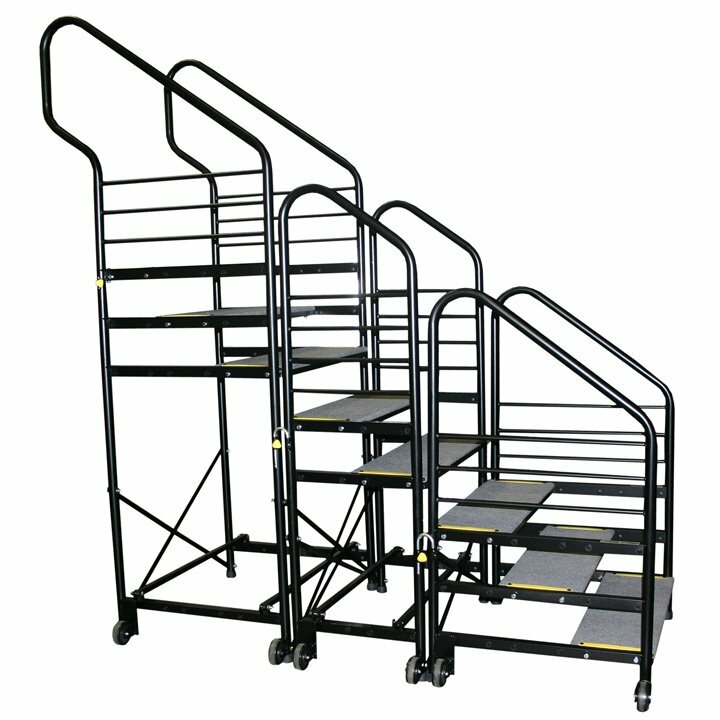 • 4 Step rise for stages 32” or 40” high with wheel and guardrails. • 5 Step rise for stages 30” or 36” high with wheels and guardrails. • 5 Step rise for stages 40” or 48” high with wheels and guardrails. • 8 Step rise for stages 64” or 72” high with wheels and guardrails. • 9 Step rise for stages 48”, 64” and 72” high with wheels and guardrails.